There are a lot of FCS football games happening this weekend – a lot of games involving nationally-ranked teams and conference title contenders. But only one of those games is being played and also has a trophy associated with it. Saturday’s game marks the first of three games in the coveted Sergeant York Trophy series which goes to the winner of the quadrangular season football series between the four Ohio Valley Conference football-playing schools located in the state of Tennessee – Austin Peay, Tennessee State, Tennessee Tech and UT Martin. It’s a unique concept whose closest cousin might be the Commanders-In-Chief trophy, presented to the winners of the contests between Army, Navy, and Air Force. And UT Martin takes a lot of pride in winning the trophy for three consecutive years – despite the fact that last year, in Nashville, they lost a 34-30 barn-burner to the Tigers. Additionally, the Tigers beat the Skyhawks in agonizing fashion, when Ronald Butler hucked up an 8 yard pass and WR Patrick Smith, with a giant leap that is his trademark, grabbed the game-winner with 18 seconds left to play. The Skywawks, who finished 7-5 last year, may have lost a possible at-large FCS playoff bid as well as a result of the heave and grab, so UT Martin has plenty of revenge on their mind, certainly. The Sargent York Trophy weighs heavily on the minds of Tiger fans, too. Though they beat UT Martin, they lost the two other Sargent York trophy games – vs. Murray State and Tennessee Tech later in the season – to finsh 7-4 and, like UT Martin, fail to qualify for an at-large bid to the FCS Playoffs. The extra juice that the trophy provides to this game should make it another barn-burner that should be a thriller. And this time I think the Skyhawks get their revenge. 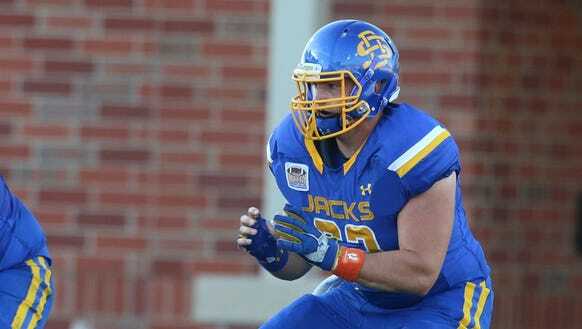 Offensive line depth was a potential area of weakness for South Dakota State two seasons ago. The 2015 team graduated three starters, and other members of the line had battled injuries, so the coaches hatched the idea to convert Tiano Pupangatoa from a defensive tackle to an offensive lineman. Maine at No. 1 James Madison. The banged-up Dukes get their first true test since they beat FBS East Carolina in Week 1, and honestly, some might try to say that the Pirate victory wasn’t exactly a challenge, either. They face a Maine team that is 1-1 and coming off a bye week, but already have a conference loss and come into this game really needing this one. Do the Black Bears pull off the upset? Very tempted, but no. Dukes 34, Black Bears 28. Gardner-Webb at No. 9 Wofford. The offensive-challenged Runnin’ Bulldogs will have their hands full with the Terriers. Terriers 37, Runnin’ Bulldogs 3. No. 12 Illinois State at Missouri State. Brock Spack’s Redbirds have looked like a Missouri Valley Football title contender so far, and Missouri State’s not going to change my mind this week. Redbirds 38, Bears 14. Rhode Island at No. 16 New Hampshire. Idea: New Hampshire, Holy Cross, Rhode Island and Harvard all play for the quadrangle “Bunker Hill Trophy”. The Rams, fresh off their upset of Harvard, would then have a chance to take home another trophy – but New Hampshire, victims of an upset by Holy Cross last week, would undoubtedly be wishing to restore order. Hypothetical quadrangle trophy notwithstanding, the Wildcats will restore order this week. Wildcats 51, Rams 16. Montana State at No.19 North Dakota. Speaking of restoring order, can the Fighting Hawks do that with the Bobcats coming to town? Both sides come in with two losses, giving this contest an air of desperation. In the friendly confines of the Alerus Center, I think the team that rights the ship is North Dakota. Fighting Hawks 31, Bobcats 26. Robert Morris at No. 2 North Dakota State. Apparently the Bison like to eat their cupcakes at home. Bison 56, Colonials 0. No. 17 Samford at Western Carolina. How good are the Bulldogs and Catamounts, really? If Western Carolina can slow down the Bulldogs on offense, they might have a chance, but I don’t think so. Bulldogs 36, Catamounts 27. Elon at No. 6 Richmond. The Spiders have been adept the last few weeks at being dream crushers, knocking out early-season darlings Colgate and Howard. This week’s early season dreamers they’ll be crushing is Elon. Spiders 41, Phoenix 21. No. 21 Western Illinois at Coastal Carolina (FBS). The Chanticleers struggled with turnovers last week in a loss to UAB, but they get an admittedly talented Western Illinois team that is coming off their third straight road game. I love the Leathernecks, but not in this spot. Chanticleers 30, Leathernecks 20. No. 25 Holy Cross at Dartmouth. The Crusaders, who came out with guns blazing last week in a shocking upset of New Hampshire, probably won’t be able to duplicate that effort against the Big Green. But they won’t have to. Crusaders 24, Big Green 3. Liberty at No. 5 Jacksonville State. Two excellent football teams will be tangling at Burgess-Snow field in Jacksonville this weekend, the high-flying Flames offense and the stifling Gamecock defense in Jacksonville State’s home opener. I’m wondering if the Flames are a little sharper, though, having played last weekend and might be a little looser. Flames 35, Gamecocks 34. No. 22 Grambling State at Mississippi Valley State. 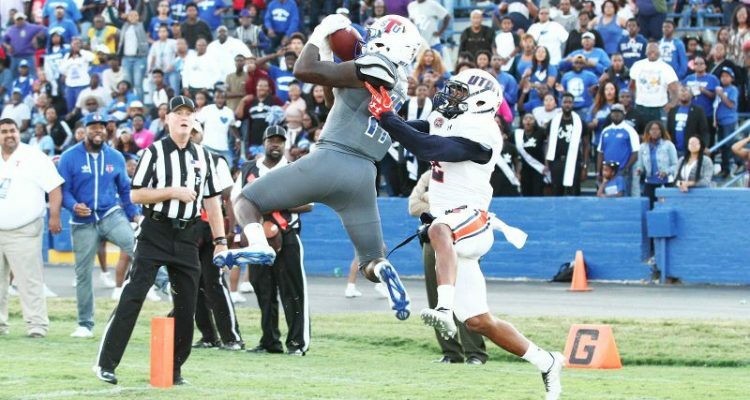 An ironclad rule in picking games is: “go with the team that hasn’t been outscored 127-10 in their last two games.” Tigers 55, Delta Devils 16. No. 15 North Carolina A&T at Morgan State. Another ironclad rule in picking games is “always pick the team that has scored more than zero points after contesting three football games.” Aggies 42, Bears 0. No. 23 Nicholls at No. 3 Sam Houston State. People are wondering if Nicholls, who are 2-1, beat McNeese State and put the fear of God in Texas A&M, have what it takes to knock out Sam Houston State on the road in Southland Conference play. Want to know what I think? Bearkats 50, Colonels 27. UC Davis at No. 18 Weber State. Are the Aggies able to take another step towards a strong Big Sky season with perhaps a championship and/or FCS playoff bid? I think the Wildcats, who have acquitted themselves well at Cal and Sacramento State, is too tall a task. Wildcats 34, Aggies 21. No. 11 Eastern Washington at Montana. The final game of the evening is going to be a dandy between to huge Big Sky rivals – even though the Griz, down a QB after starter Reese Phillips went down with a broken leg last week, really are behind the eight ball. Hard to see Eastern Washington, who reclaimed momentum last week in beating Fordham in the Bronx, falling here. Eagles 49, Grizzlies 24.